seven Best Practice Structures and cutting-edge implementation strategies are proven across the grades and subject areas. BP4 creates common ground for teachers, leaders, and principals by recommending practices drawn from the latest scientific research, professional consensus, and the innovative classrooms of exemplary teachers.BP4 puts top-quality teaching at the fingertips of individual practitioners by sharing real-life instructional scenes that define classroom excellence, increase learning, and improve students' life opportunities. It's also more valuable than ever to PLCs and school reform initiatives thanks to:plans and strategies for exceeding state and Common Core Standardscohesive principles and common language that strengthen professional collaborationclassroom vignettes that show teachers and kids at workchapters on reading, writing, math, science, and social studies that support unified instructional goalsspecial attention to technology in the classroom, special education, ELLs, struggling readers, and the arts.This new educational era demands highly-effective, high-quality instruction that makes a difference for students. 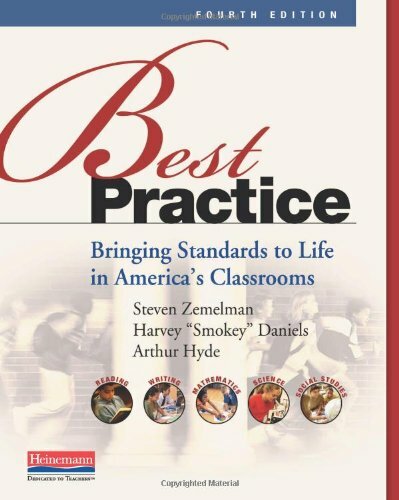 Fortunately with Zemelman, Daniels, and Hyde's help every educator can be a world-class, life-changing teacher-a Best Practice teacher.PLCs and book-study groups! Save $66.37 when you purchase 15 copies with the Best Practice Book Study Bundle. mathematics and problem solving in Chicago and its surrounding school districts.